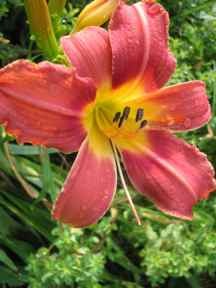 With my first perennial garden in the early eighties, I had one frosty peach Day Lily called Theresa Hall which is still with me. 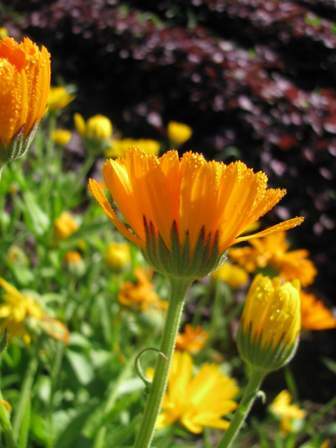 I keep it mostly for sentimental reasons as its Flowers are small and easily lost in the June garden. 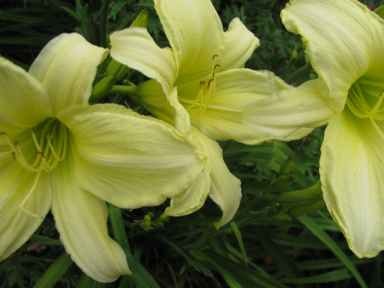 A gardener friend gave me a couple of the classic June blooming Lemon Lilies and one early season pale orange Lily. I liked how this orange Flower showed up in a season of mostly blues and pinks. 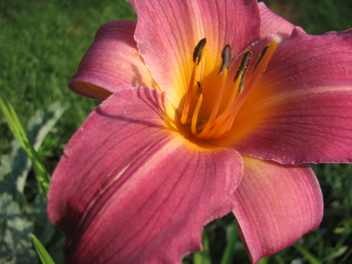 I also transplanted some of the Day Lilies that grow wild around here to a spot at the top of our driveway. They are a tall deep orange Lily that grows with abandon along the roadsides of New Hampshire and Vermont. They have liked holding up their spot at the entrance to the farm, and I have liked having them there. 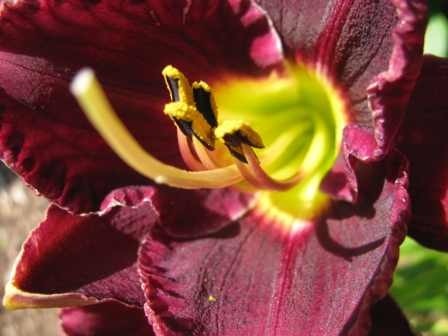 The gardens here now contain a deluge of Day Lilies. 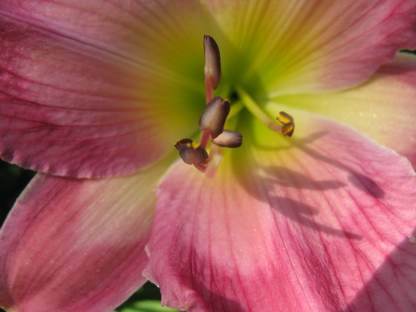 Below are some of the ones blooming right now. I relish how many others are still to come in August and September. We had a much needed downpour last night. Even the wildflowers were drooping before this night of rain. 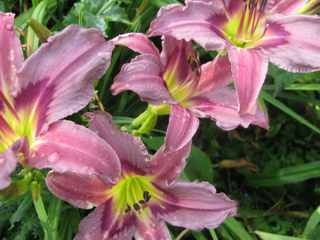 The Day Lilies deserve a nod for having managed to look fresh and beautiful even through the preceding crisp hot weeks, though I must say this morning as I went out to deadhead them, they looked as refreshed by the rain as everyone else. 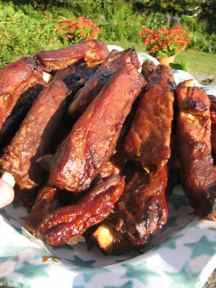 When the kid’s Uncle Steve coined the phrase “The Summer of Steve” he was talking about his fantasy summer of boating, golfing and kicking back on his deck with Sports Illustrated. 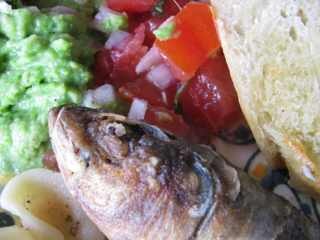 For us, “The Summer of Ben” is an entirely different kettle of fish, at least as fantastic as “The Summer of Steve” and actually involves fishâ€¦.. as in fried fresh sardines, shown below with roasted garlic and fresh pea tapenade, fresh salsa with cilantro and homemade bread. and of course throw the ball for MayMay. THENâ€¦. he comes next door to cook dinner for all of us. EVERY NIGHT! 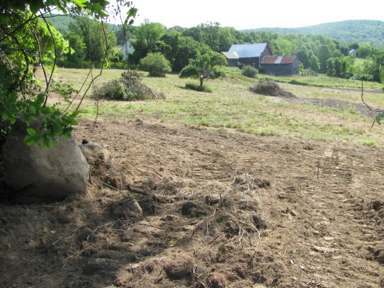 My only responsibility is to tell him what’s out in the vegetable garden up for grabs then during the hour or two that I have always spent tossing together a meal for the family, I go off and read or take a swim or putter in the garden. BLISS. 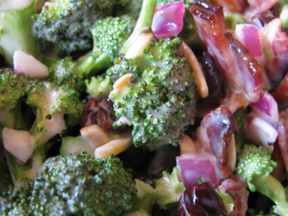 When I said broccoli and red onions, Ben delivered a bacon, raisin and broccoli salad. 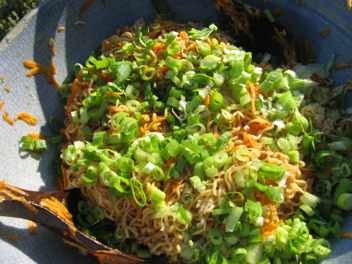 When I said green onions and carrots we feasted on a sesame cold noodle salad. 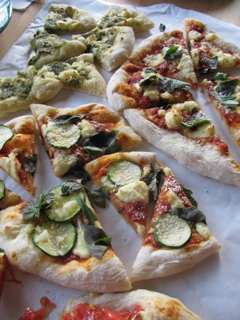 When I said high summer, Ben tossed out pizza with scratch dough and homemade mozzarella and homemade pesto along with fresh tomatoes and zucchini. Crab Rangoon- for the same meal! 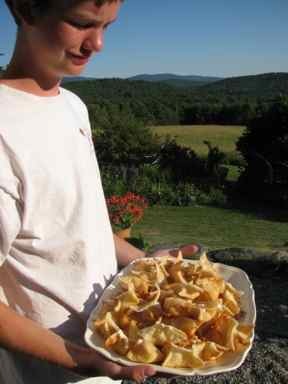 May “The Summer of Ben” last forever! 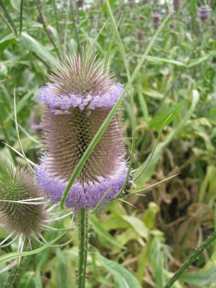 Teasel Flowers are a fortress of protective architecture with each blossom unique in the energy issues it addresses. 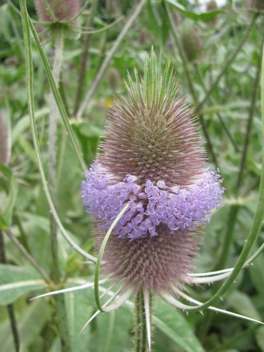 When making our Teasel Essence, the Angels and Elementals choose many blossom heads with rings of petals in different locations on the blossom head. 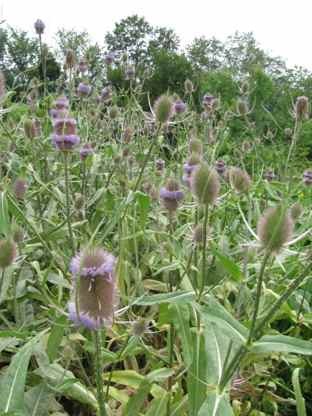 This is because the location of these rings indicate the particular strength of each Flower. The position of the rings correlated to our chakras. Rings at the bottom offer first second or third chakra strengthening. Upper rings indicate upper chakra strength. Double bands mean the Flower works on two chakras, and top petals indicate a focus on the crown chakra. 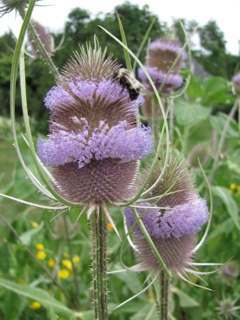 By choosing a diversity of blossoms with rings in different positions for our Teasel Essence, the final Essence is guaranteed to help you with energy issues in any chakra. I can’t exaggerate how important this Essence is! While it has gotten a lot of attention as the Flower Essence for Lyme disease, it supports all of us to strengthen our chakras and live with greater vitality and energetic integrity. 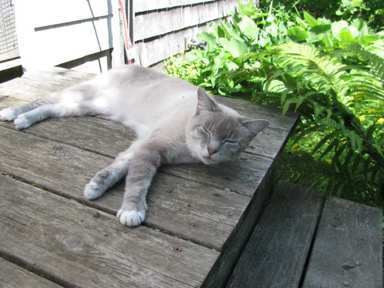 Here is the only staffer not working to solve our technology problems. The rest of us are trying to get to the bottom of our Facebook, email, phone, fax, internet problems, and today we do seem to have solved some email issues. Our in the gardens, things are running more smoothly. The Calendula’s are overseeing the Red Shiso. Looks like we are going to have one of our best crops in years! 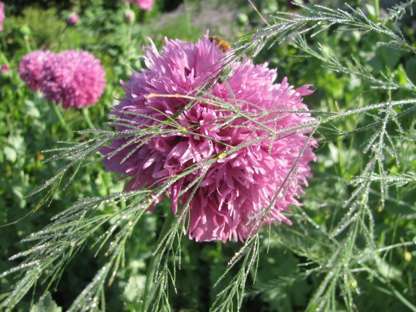 Here the fronds of an Asparagus gone to seed has flopped over a Mauve PomPom poppy. This time of year annual Poppies in shades of red, coral, pink, and this mauve pop up everywhere. 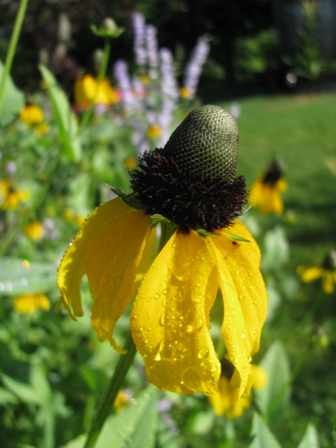 In tune with our celebration of all things Mexican, this Mexican Hat Plant shines in a bed of Lavender Larkspur.